This is a beautiful and not-so-complicated recipe from Saveur. You can find the original here. 1 Heat oven to 375˚. Zest lemon, slice in half, and set aside. Pile zest, rosemary, sage, and garlic on a cutting board; chop together with a knife until combined; set herb mixture aside. 2. 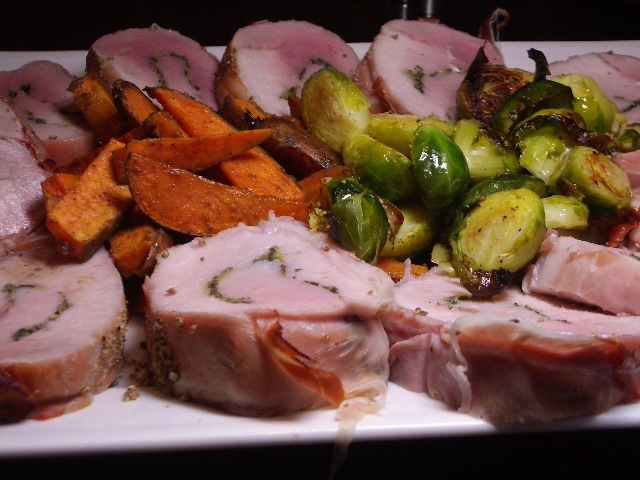 Using a knife, butterfly pork loin (we’ve done this before). 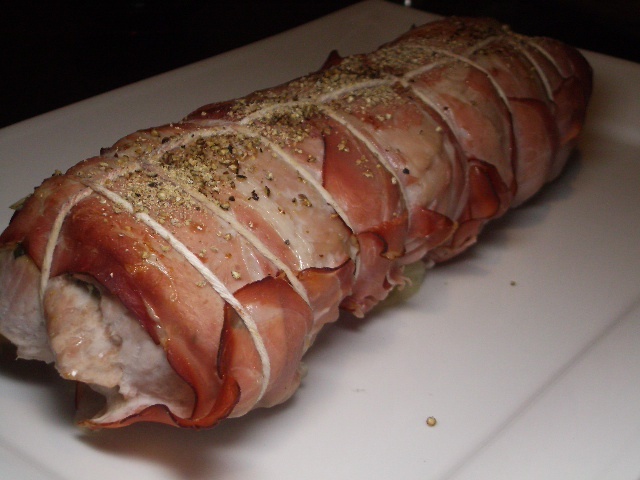 Season both sides with salt and pepper; rub both sides with herb mixture; roll loin. 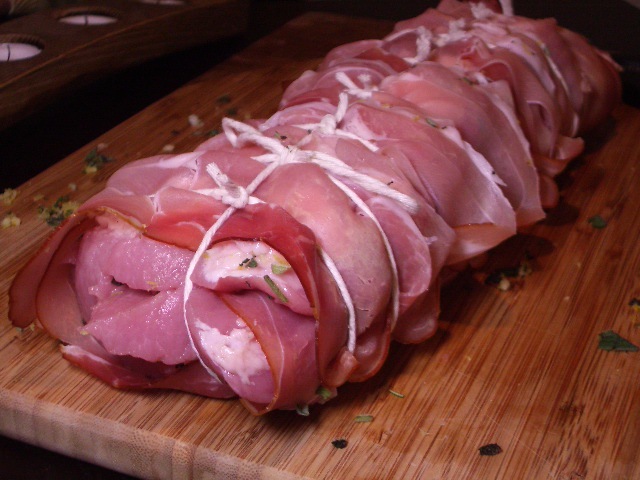 Wrap pork in prosciutto; tie with kitchen twine. 3. Heat oil in a 12″ skillet over medium-high heat. 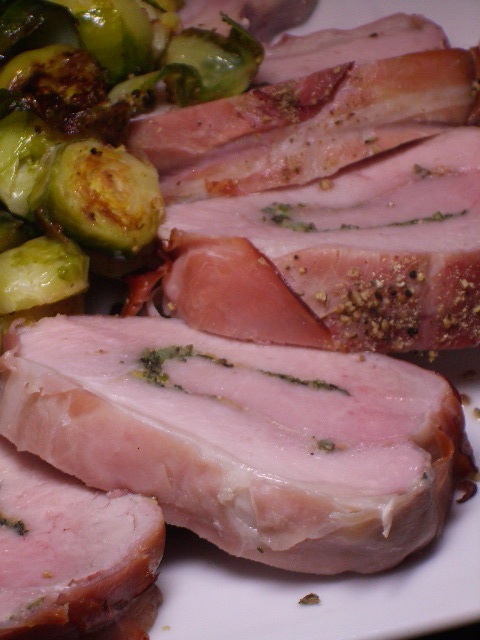 Cook pork roast, turning occasionally, until browned on all sides, about 12 minutes. Transfer pork to a plate. Nestle onion slices in skillet and pour in 1⁄2 cup water; put pork on top of onions. Roast, basting occasionally with pan juices, until an instant-read thermometer inserted into middle of roast registers 140˚, 45–50 minutes. Transfer pork to a cutting board; let rest for 20 minutes. 4. Slice pork; transfer to a platter along with onions. Squeeze juice of reserved lemon into skillet; whisk. Serve pan juices with the pork and onions.